A very rare antique oak pew that we believe to be approximately 400 years old, quite possible Elizabethan and dating to approximatley 1600. 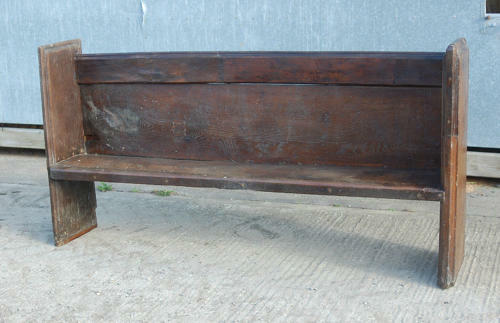 The oak pew is a fantastic piece, full of history, and is still solid and useable. The oak has a rich colour with a wax finish and the desigin is of a classic church style, with high sides and back and a simple seat. The sides have a carved, plain border. The bench, due to age, has been patch repaired in many places and has been shortened as it was part of a longer bench. One side has been attached and there are parts that have been added, such as the top piece using pieces from the extra length of bench that was removed due to damage. There are some extensive scratches and marks and there is some damage to the back rest on one side. The bench has had woodworm that is now treated, however some woodworm holes are visible. There is some erosion and some slight damage to the legs. The seat has slightly wider areas and uneven edges. The wear and weathering enhance the benches history and age and it has a fantastic antique charm. The bench is a very special item with great age and history. The bench would be perfect for a kitchen or dining room table or could be used in a hallway. A truly desireable and rare item thats age makes it a very special piece.